This past spring, Mike traveled down under a few times, and spent some time teaching painting classes and doing some extra painting work as well. 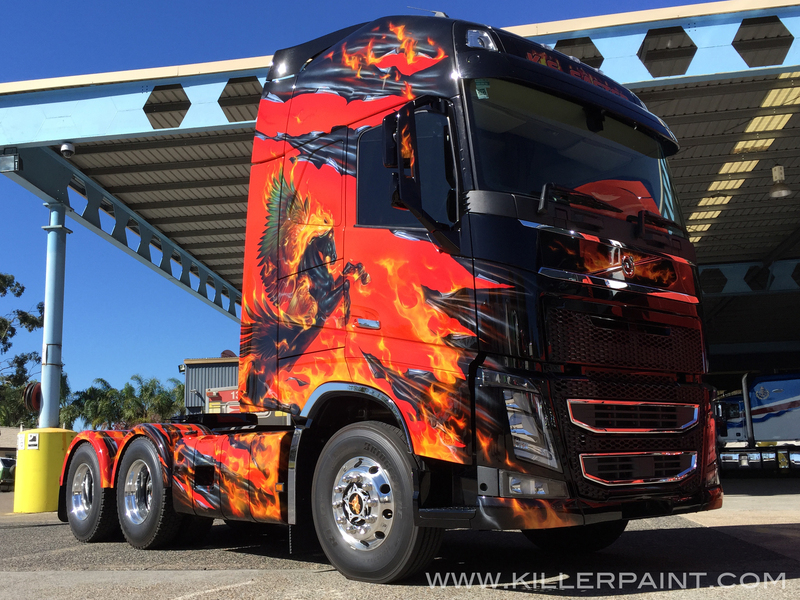 One of the projects he got to work on was this Volvo semi truck for KS Easter Trucking. East Coast Airbrushing owner Rod Tickle, a long time friend of Mike’s, brought him in on the project. There was a tight deadline in which to complete it before it was to be revealed at a special event at the Kenworth plant, so Mike and Rod worked had to work hard and fast to get this sizable project done on schedule. 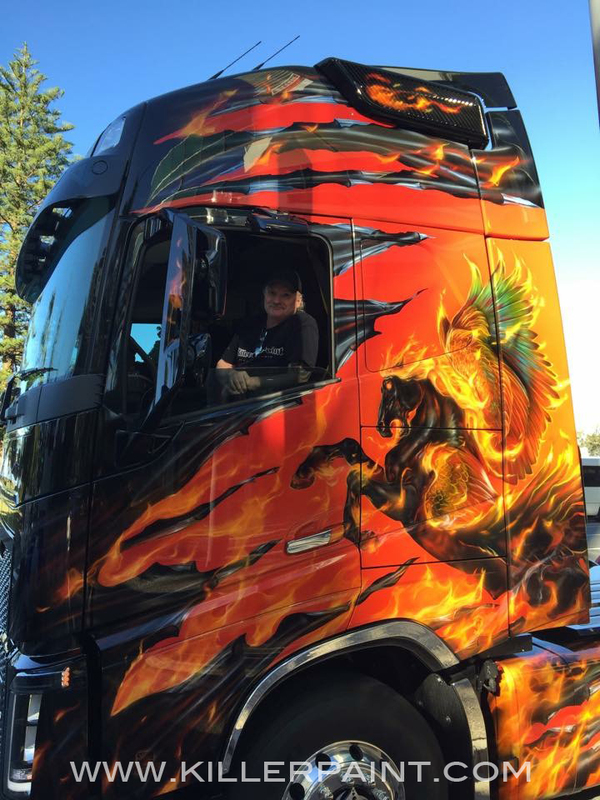 The company wanted something special for this truck, so it got the custom paint treatment from bumper to bumper. 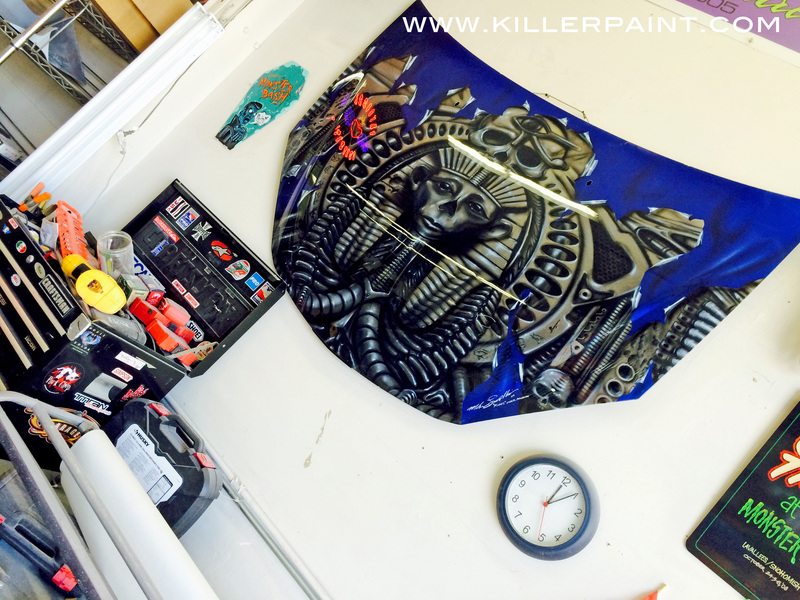 All of the paint used in the artwork on this project was from House of Kolor, the paint brand of choice here at Killer Paint. Fortunately, it is available down in Australia as well. 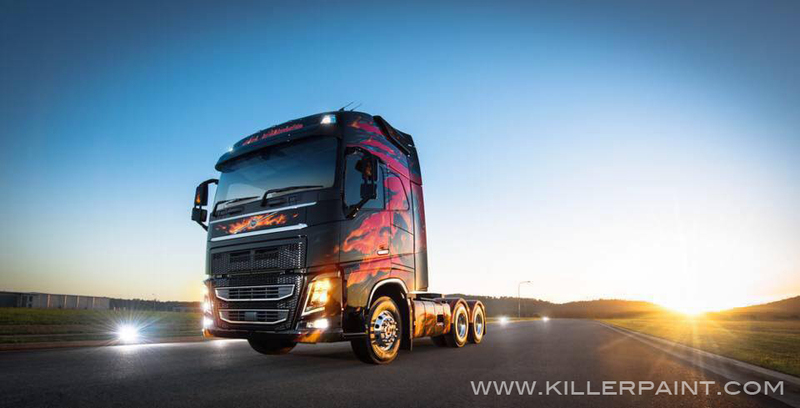 The front of the truck is painted black, which then “shreds” away to reveal a vibrant orange background with True Fire™ flames. (see more on painting shreds here.) 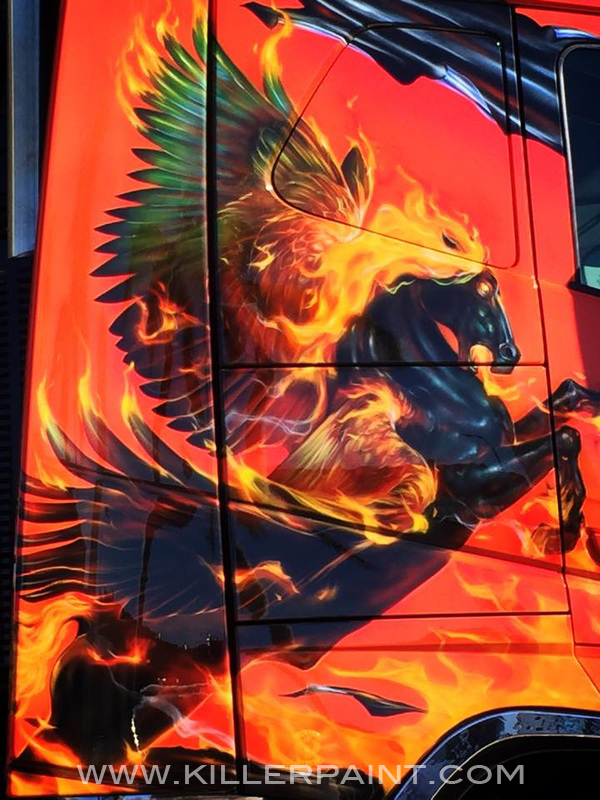 Each side has a large coal-black Pegasus, with a fiery mane and eyes. Its wings are also wreathed in flames. Mike was able to shoot this video of the finished truck on his last full day, showing some more details of the paint work on the project. 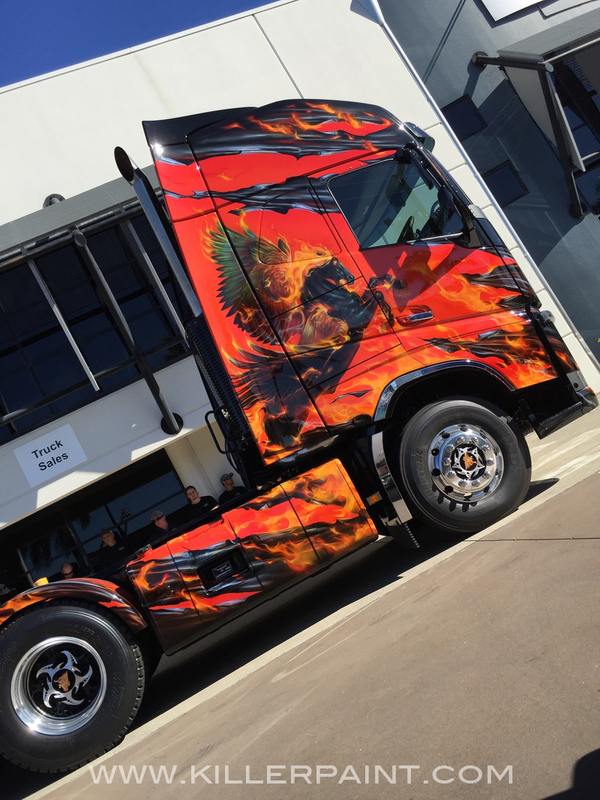 It’s only been a matter of months since the project was completed, and we’ve heard that this truck has already starting winning awards at major truck shows in Australia. Mike enjoyed his visit to Australia, and wishes it were possible to visit more often. Especially when he gets to paint projects as cool as this one while he is there! This episode of “Rides” (Season 4, Episode 3) originally aired August 9, 2005. For this show, Mike was tasked to go head-to-head on a painting challenge with California airbrush artist Yvonne Mecialis. 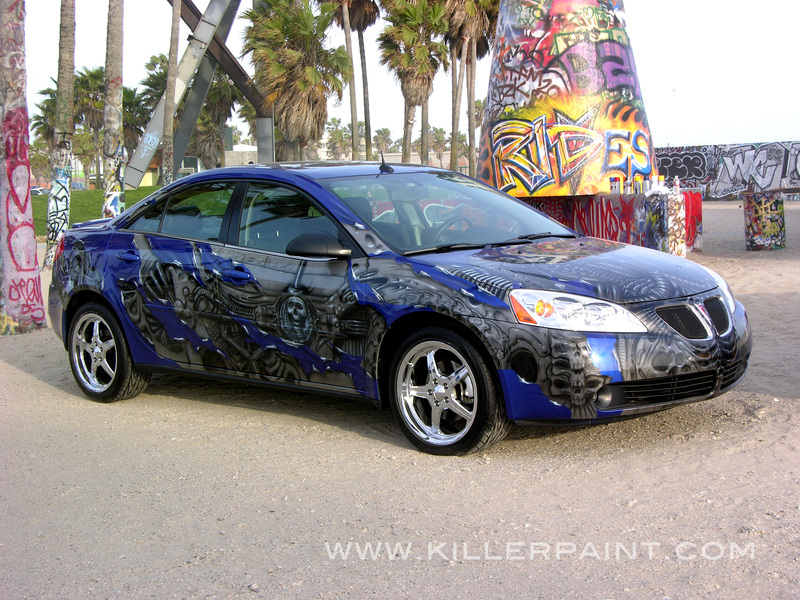 Each would receive a silver Pontiac G6 to paint, and only a week to do it! 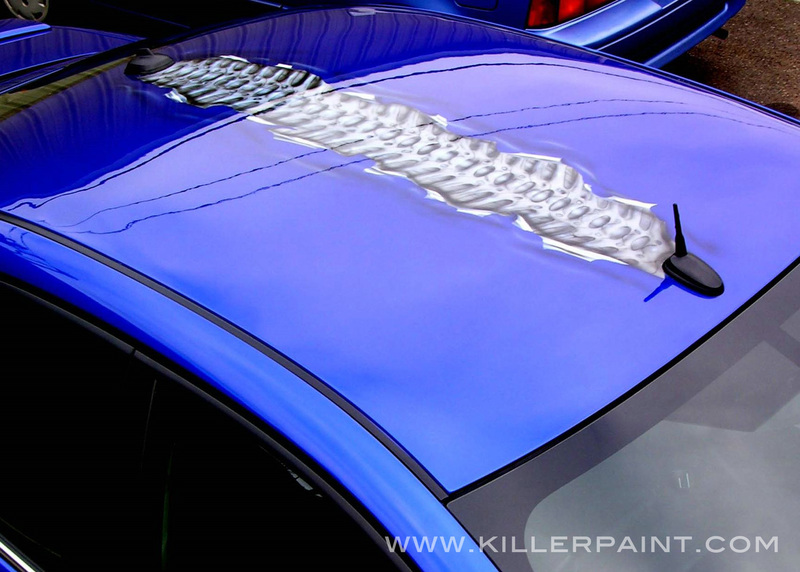 Afterward, both cars would be brought together to determine whose brush was mightiest! 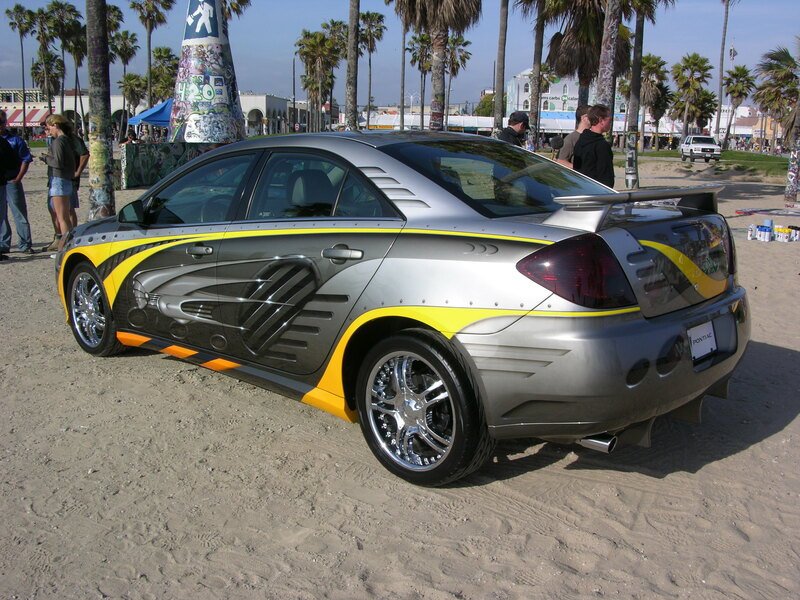 Mike decided that the car would get a biomechanical look, a la H.R. Giger, fused with an ancient Egyptian theme. 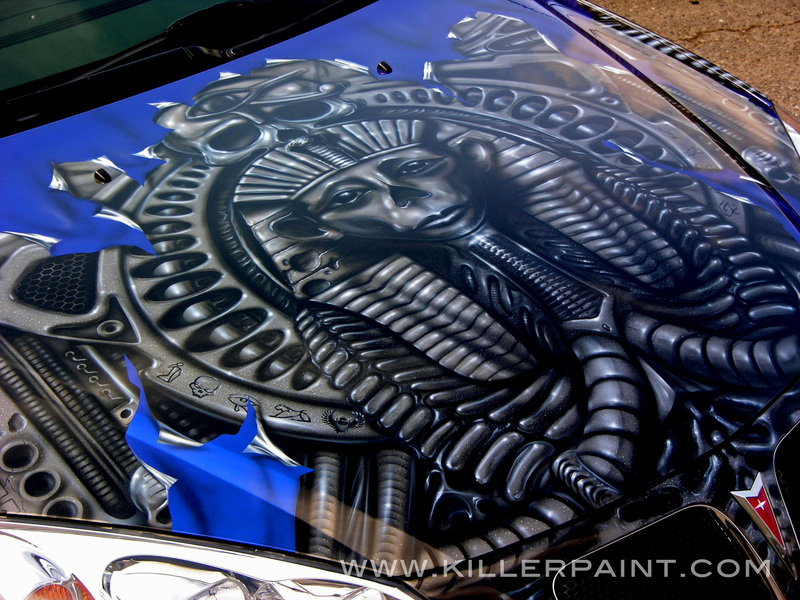 First, the car was covered bumper to bumper with biomech elements and hieroglyphs, with a Pharaoh dominating the hood. Small “Easter eggs” and other hidden nods/homages were scattered throughout the design. 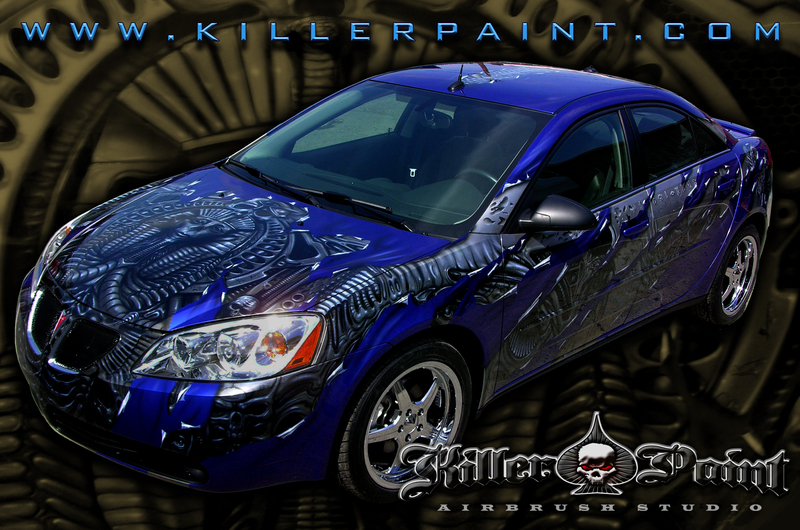 Airbrushes and Killer Paint’s skull logo were placed amongst the symbols, and the scarab used in the House of Kolor paint logo was incorporated as well. 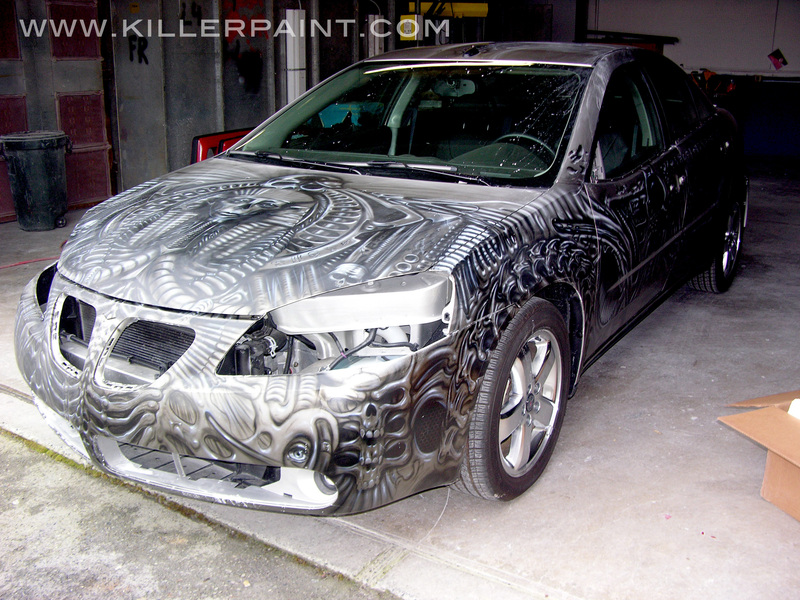 At this point, covered in elaborate silver biomech designs, the car looks like a job well done. However, what came next made some viewers’ jaws drop. Much of this design was now to be painted over! 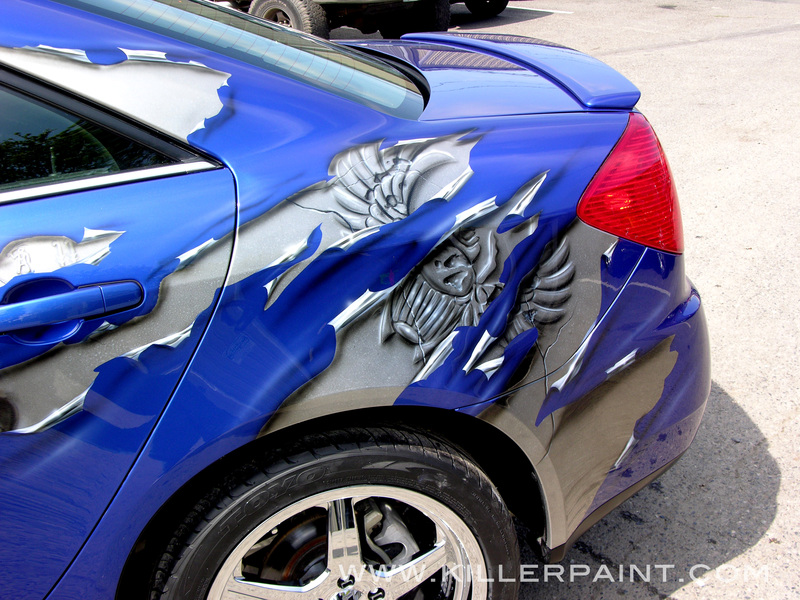 The car was masked off with an array of tears and shreds, and then painted blue… leaving the elaborate biomech elements peeking out, revealed only where the paint areas appeared to peel away. Shading and painted peeling effects added depth to the multilayer effect. A portrait of Mike’s competition Yvonne, is on the trunk lid in back. 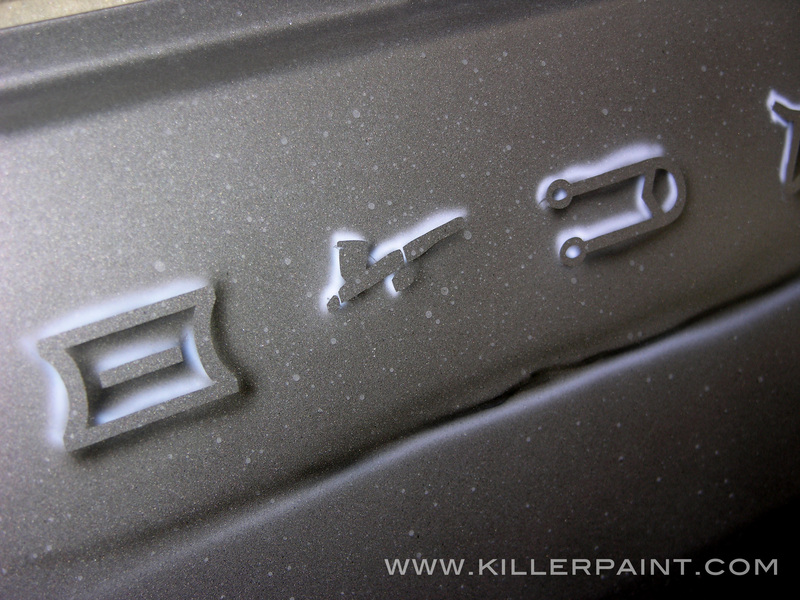 Here are some more details in the finished paint job. 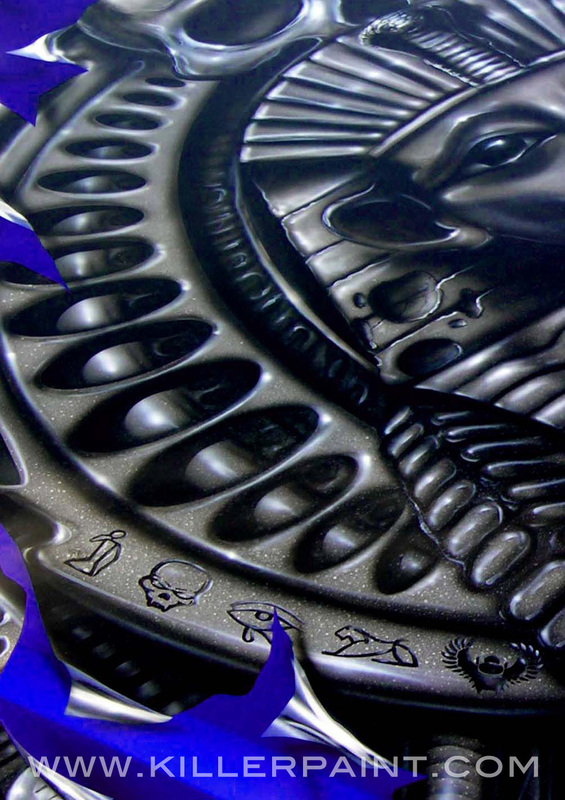 A mechanical spine is revealed on the roof, and some of the hieroglyphs on the hood. …where the competition is waiting. 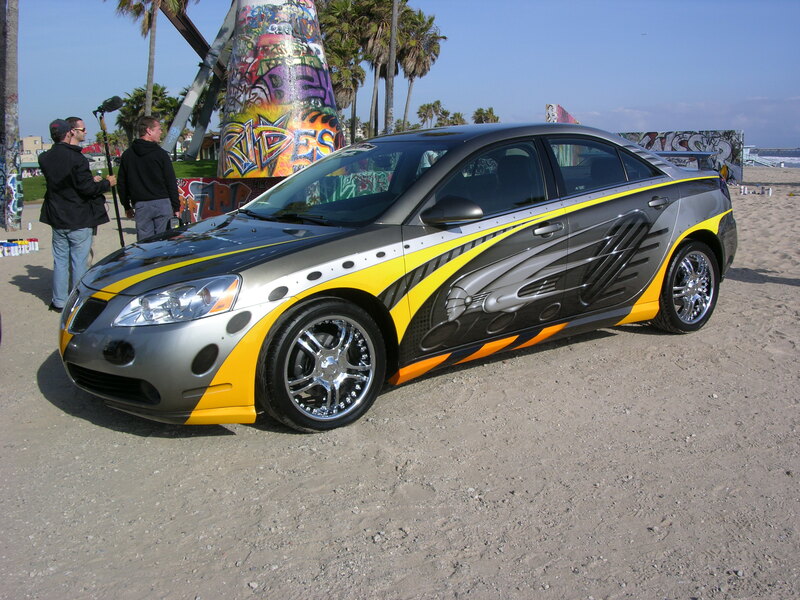 Yvonne’s car also has a biomech flavor, and possibly some inspiration from the 1927 Sci-Fi classic “Metropolis.” She incorporated bright swooshes of color into her design as well. In the end, the show’s producers decided that they couldn’t determine a clear winner, and declared the showdown a draw. Everybody wins! 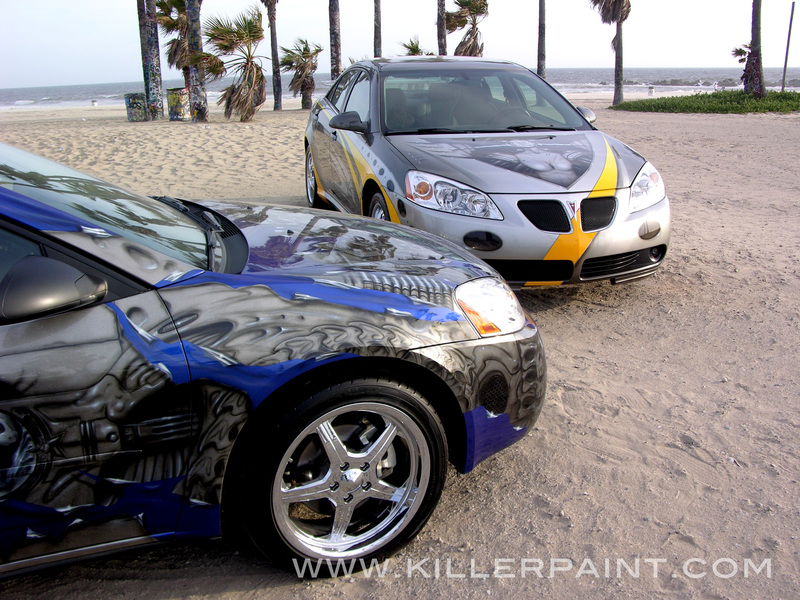 Unfortunately though, the two cars painted for this competition were not production models. They were not issued VIN numbers, and were not street legal. As such, they were scheduled to be destroyed after the show wrapped. 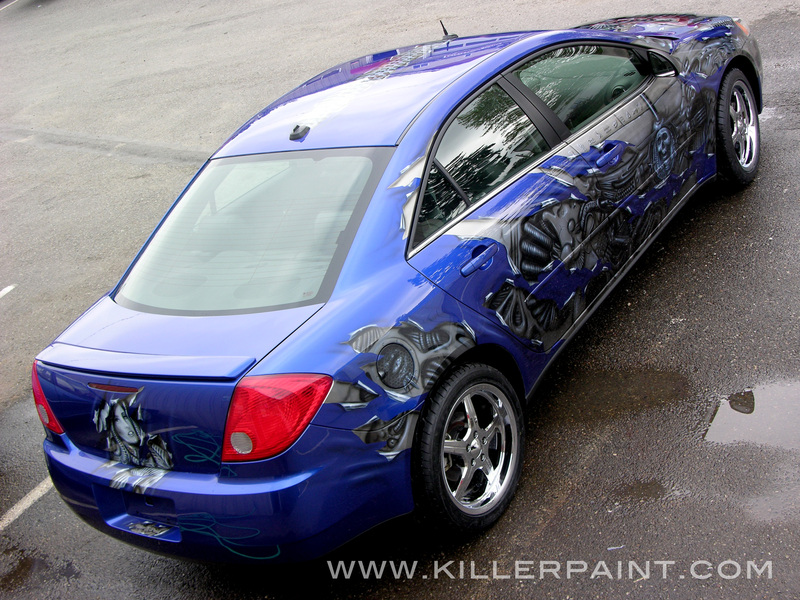 Some removable parts from the car were saved and brought back to Killer Paint before its final demise. 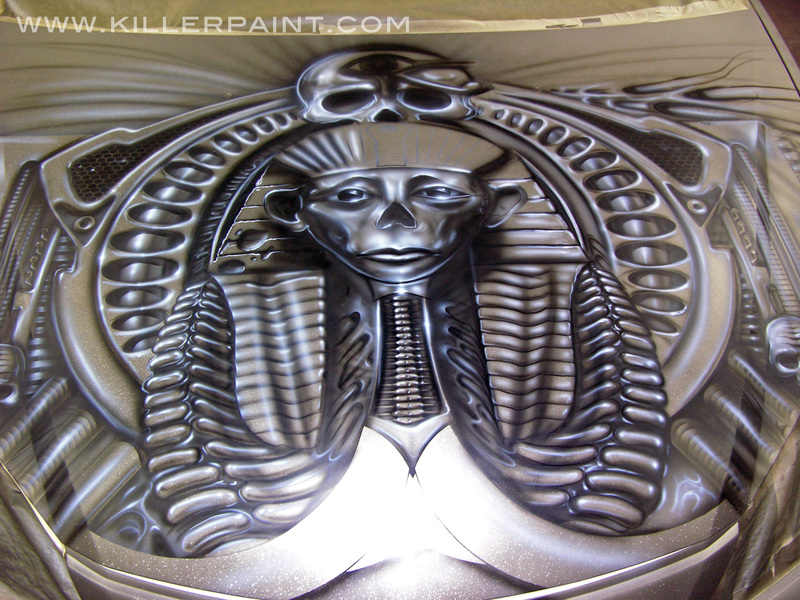 The hood featuring the biomech Pharaoh is still hanging on the wall of the Killer Paint shop as of this posting. Did you see this show when it originally aired? What did you think of the competition, and what was your favorite part of this project? Let us know in the comments! Also tell us if there is anything you would like to see posted here in the future. Oh! and Here is a bonus Wallpaper image featuring the Biomech G6 as well. Enjoy!